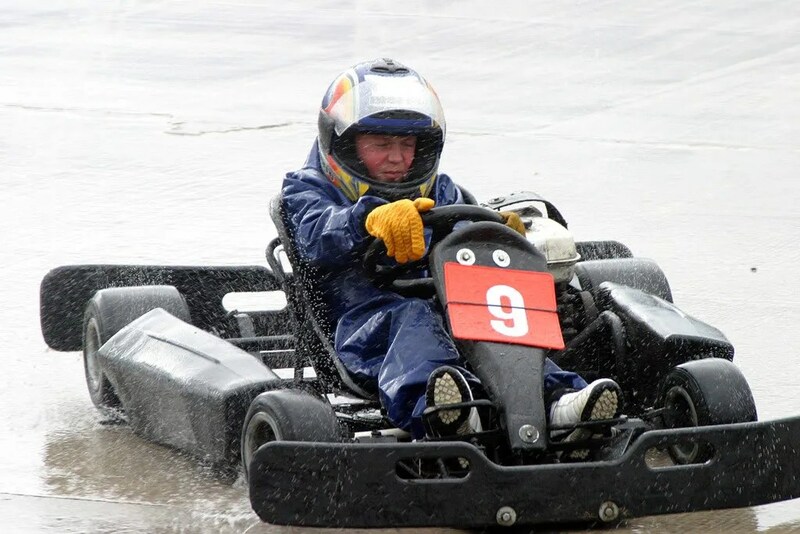 Sam started karting in the rain at Swains Karting in Buxton at the age of 10 – not sure the ‘eyes closed’ technique will catch on though! 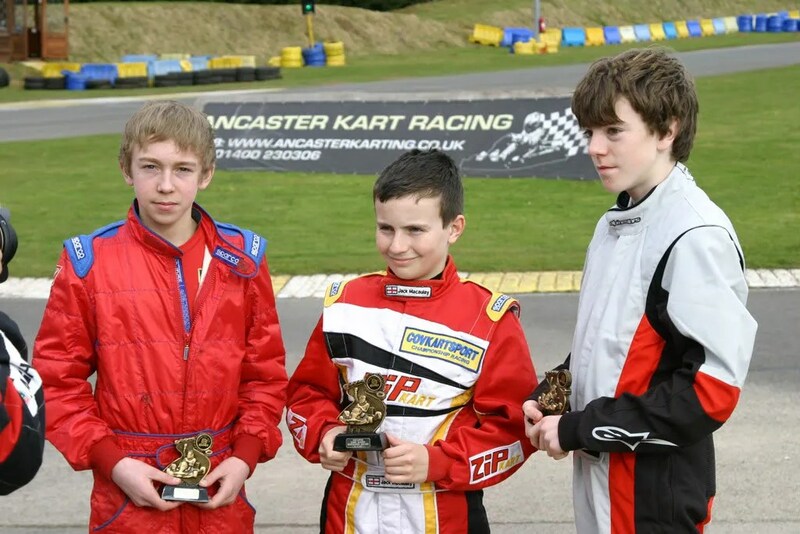 By 11, Sam and his friend Alex were the first members of the Buxton Junior Saturday Kart Club and it became a regular run to Buxton on a Saturday morning. Unfortunately Swains were, by their own admission, focussed on the casual arrive and drive trade, and quickly Sam and Alex outgrew the circuit and the competition. So at Swains suggestion, we sought another club. With virtually no local karting in Derbyshire, we resorted to a bit of Internet research, and took the treck down to try the Mr Karting Junior Race School in Harbury, Leamington. 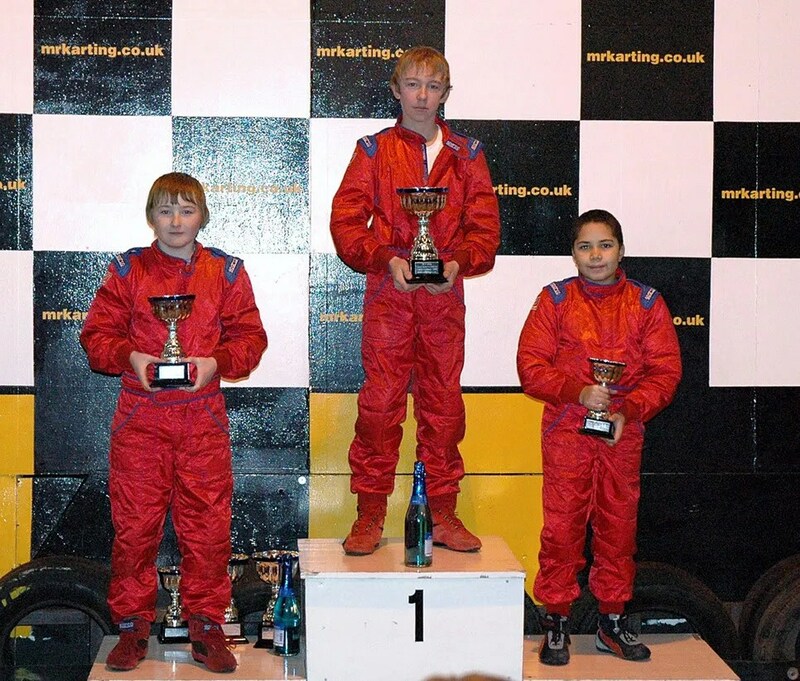 Alan and Andy at Mr-K’s are both racing nuts and have both clocked up their own karting achievements in the past. It’s a tight and twisty indoor circuit but what makes Mr-K special is the organisation and professionalism Alan and Andy run the place with. Saturdays are focussed on lap time improvement but once Sam got up to speed he was ready to race in the monthly Grand Prix event alongside 25-30 other hopefuls. Those first few races were daunting – and heartbreaking! Sam soon learnt how to defend and then how to take his chances! 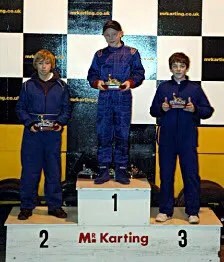 The rest of 2007 was a tough year as he fought for equality in the line up of experienced and serious youngsters at Mr-K in a mixed grid of cadet and adult karts. Competition was fierce and mistakes punished. Lap times were critical with sometimes 5 or 6 youngsters split by only thousandths of a second. flurry of impressive showings towards the latter part of the year, collecting a couple of the coveted ‘driver of the day’ awards (and extra points) along the way, Sam finished the year collecting the championship title by a narrow margin of only 8 points. In addition to the impressive trophy and child friendly bubbly, the championship prize from Mr Karting included an outdoor test day in Formula Junior TKM worth some £250. 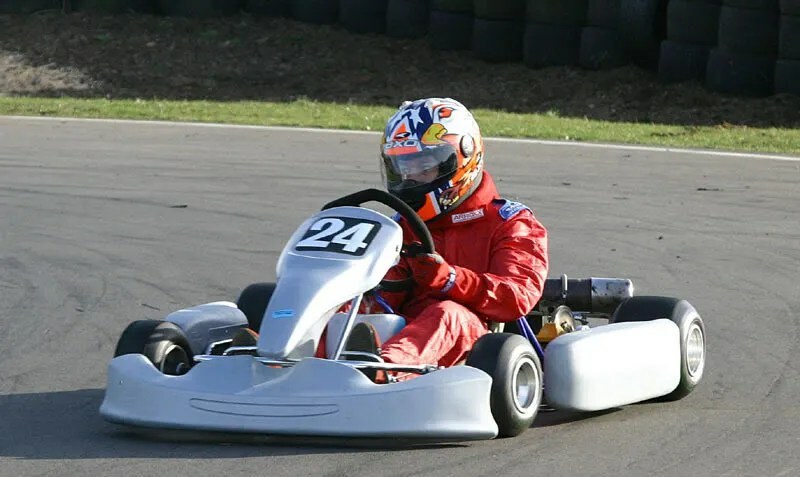 During the latter part of 2008 we tried Whilton Mill Junior Race School for some outdoor experience, but preferred the super competitive Covkartsport Winter series. Sam was competitive from his first race and despite only attending 2 of the 3 winter series GP’s he took 2nd in the winter mini series, even picking up a fastest lap along the way. 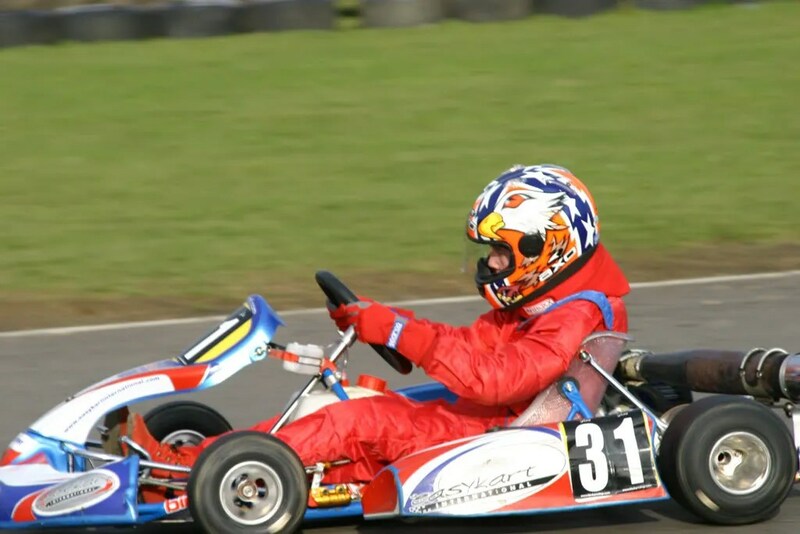 In Feb 09 we tried an Easykart Junior test at Whilton Mill as a possible option for progression. Easykart is a National (and International) ‘one make’ series featuring ‘identical’ 100cc Birrel karts. This was Sam’s first experience of 2 stroke outdoor karting and, despite the nerves; he just came off smiling from ear to ear. That day was a turning point ….. Following a period of research and lots of discussion with the other Dads at Mr Karting, we decided to join the more mainstream Formula Junior TKM class of kart and were introduced to Mark Allen at Jade Engineering. Pretty soon we were testing one of Marks reconditioned Jade chassis at Shennington and the rest as they say – is history – a deal was duly done! Mark at Jade has been a great help introducing us to the kart and supporting us through the early stages of kart ownership. He also recognised Sam’s speed in those early sessions and encouraged us to immediately put in for the ARKS test. [ This is a written and practical driving test required by the MSA before anyone is allowed to race. ] Before we knew it, not only were we kart owners, but we were also a fully licensed novice and ready for our very first MSA race. The nerves were certainly kicking in by this time. …….. There followed an intensive testing schedule during the Easter school holidays (including a very wet Shennington Wednesday) to prepare us for our very first race weekend. Read our race blog elsewhere on this website for a description of our race weekend adventures.